The quintessential Ford - This Ford Mustang speaks volumes about its owner, about uncompromising individuality, a passion for driving and standards far above the ordinary. Based on the superb condition of this vehicle, along with the options and color, this Mustang is sure to sell fast. Price. Performance. Protection. This vehicle has it all, including Ford's Certified Pre-Owned Warranty. Fast and exciting, this Mustang is a true testament to the pursuit of automotive distinction by Ford. Once you're behind the wheel of this incredible machine, you will not think twice about purchasing this vehicle from Galpin. 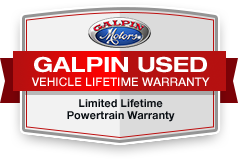 Call us today to see this well-kept beauty in person and experience 'Galpin Used Car Difference'. All figures are EPA estimates. Actual mileage will vary. Kelly Blue Book values are calculated based on the current Retail Book. Pricing analysis performed on 4/5/2019. Please confirm the accuracy of the included equipment by calling us prior to purchase.